Today I’m sharing a Design Team project for the Just Imagine Crafts/Kreaxions Punches Blog. I created this Keurig K-Cup Box using my Cricut and the Sweet Tooth Boxes cartridge. I made the doilies on top of the box using the following Kreaxions products: Kreaxions 4 in 1 punch #305 with the A insert and the Star Stencil and the Kreaxions 4 in 1 punch #918 with Positioning Parts 8cm and the A Stencil along with the Circle Cutter. Nine K-Cups fit perfectly in this little box. What a great way to share K-Cup samplers. Today I have the Tuesday Tools, Tips and Technique Challenge at Turtle Soup. My challenge is to create a card, layout, tag, ATC or altered project with the focus being on "words". Be sure to check out the details in the Turtle Soup forum. Word Clouds - I love them! A word cloud is a graphical representation of word frequency. I have found several sites where you can make these and have tried several times to no avail. Sometimes I can be a little technologically challenged. I came across a site (A Turn To Learn) that has the best tutorial (July 24,2012). She spells everything out step by step. I found the Tagxedo site easy to use and if I can do it anyone can do it lol! On one of our trips to FL we took a small detour and stopped at Antique Archeology in Nashville, TN. We purchased this wonderful old typewriter. And the best part was that we happened to see the episode of American Pickers where Mike and Frank had picked it. As soon as we purchased it I knew what I wanted to do with it ... and almost a year later ... I added the word cloud. I try to come up with inexpensive teacher gifts for the grandsons to give their teachers every month. With some frames from the dollar store and the Tagxedo program I came up with this month's gifts. I chose the rectangular shape and used 10 words that I thought described a teacher best for this word cloud. I loved the way it turned out. I have the Saturday All Sorts challenge up at Turtle Soup today. Be sure to check out the forum for the challenge details and the rest of this weeks inspiring challenges from the Turtle Soup Design Team. I finally had some time to play with my “messy supplies”. My “Messy Supplies” for this page included: Super Heavy Gesso, a Stencil, Distress Ink, and some Spray Mist. My challenge to you is to use any of the above messy supplies on a card, tag, layout, ATC or altered project. 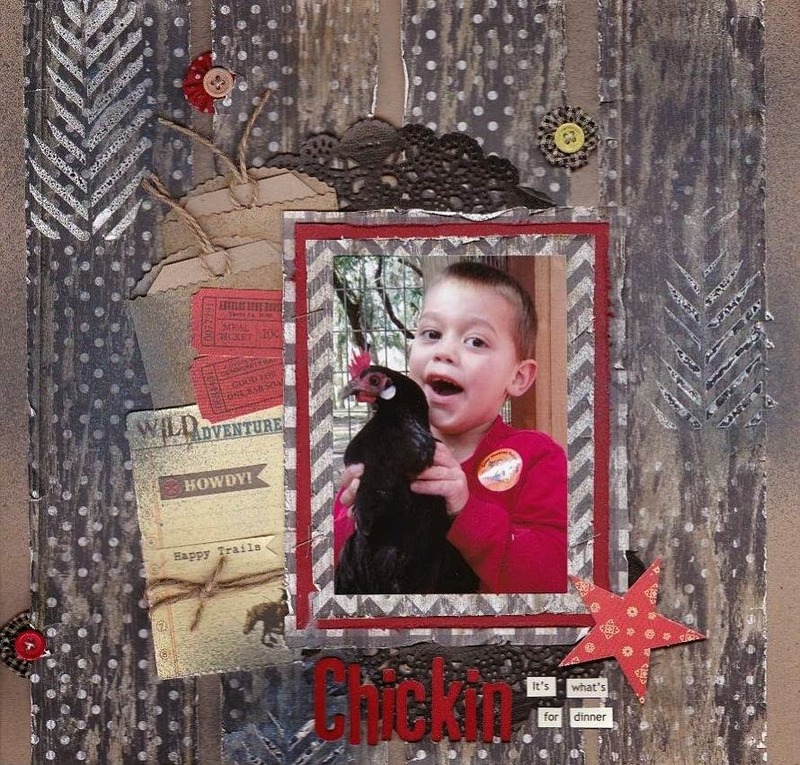 I love using border strips on my scrapbooking pages, cards and tags. Borders just seem to add a little more style and texture to any project. Using the Kreaxions punches to create perfect borders every time is easy and fun. I created this Valentine’s Day tag using paper left over from other projects. The chipboard and other embellishments were all in my hoarded supplies … I mean stash. I created the border using the Kreaxions 4 in 1 punch #917. The perfect punch for Valentine’s Day projects. Be sure to check out the Just Imagine Crafts/Kreaxions Punches Blog to see what the rest of the design team created this week. There is a Design Team Reveal up on the Just Imagine Crafts/Kreaxions Blog today. I created a card for Valentines Day using the Kreaxions 4 in 1 punch #917. I used the punch on the edge of my paper before creating the medallion. To finish the card I found a sequin heart in my stash. I also found some (very old) American Crafts border Rub-ons which I add to the bottom of the card. Be sure to check out the Just Imagine Crafts/Kreaxions Blog to see what the rest of the design team created.